Environmental charity Hubbub announced yesterday that it is to launch a new vessel in the battle to clean up plastic from Britain’s polluted waterways. The 12-seater punt made from 99% recycled plastic will take its maiden voyage next month in Manchester’s Salford Quays, the setting for last year’s disturbing images of swans foraging for food amongst masses of plastic litter. 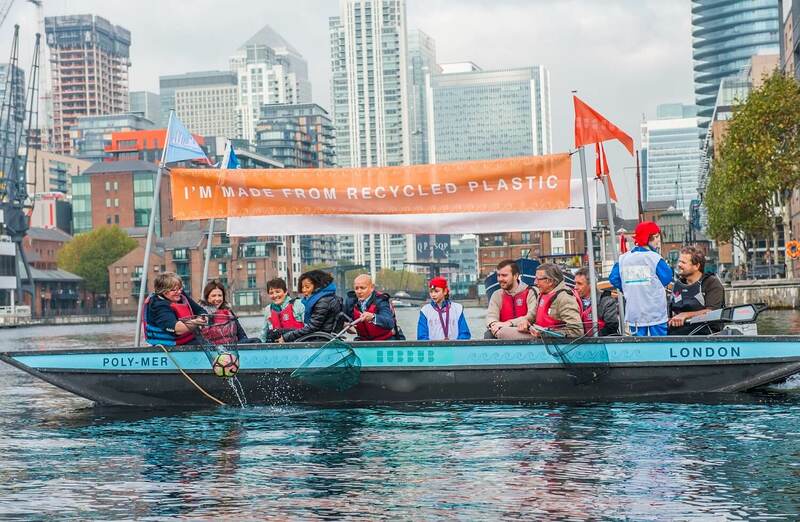 From April to June the boat will go on tour across the UK, taking the public out on ‘plastic fishing’ trips to raise awareness of the growing levels of plastic pollution in UK’s rivers and canals and to encourage more people to recycle their used plastic. The boat has been built from plastic collected on previous plastic fishing trips, with plans to build a litter-busting fleet across the UK — a fantastic example of the circular economy in action. The boat has been built using funds collected from Starbucks’ 5p charge on drinks purchased in a paper cup across its 950 stores nationwide. It’s only the third boat of its kind in the world and the first to launch outside of London. The craftsman tasked with building the boat was expert boat-builder Mark Edwards MBE, who also built the Queen’s barge ‘Gloriana’. The design is based on a traditional punt, but it’s made from the most modern of materials — Plaswood, a hardwearing alternative to wood that is made entirely from recycled single-use plastic — and it’s powered by a rechargeable electric motor making it the most sustainable of boats. The plastic fishing tour will see the boat used for a week in each of Birmingham, Bristol, Manchester and across central Scotland. In each location Hubbub is partnering with local organisations and volunteers, who nominated their area to take part in the Plastic Fishing Tour as part of a competition in partnership with the Daily Mirror to raise awareness on the issue of plastic pollution across UK waterways. One of the four areas will ultimately be chosen to keep the boat on a permanent basis. Gavin Ellis, Co-founder and Director of Hubbub, said: “The pictures we’ve received from all over the country have shown how widespread the problem of plastic pollution is and it’s heartening to hear about the great work being done by volunteers battling to keep their local areas clean and safe for wildlife. Jaz Rabadia, UK senior manager of energy and sustainability, Starbucks Europe Middle East and Africa, said: “As a business we are continually looking at ways in which we can help to shrink our environmental footprint – whether that’s in the way we operate or by helping our customers to make more sustainable choices. 20 – 29th May – Bristol in partnership with Sustainable Hive, Bristol Waste Company, Sea Cadets, and Bristol Harbour Authority.